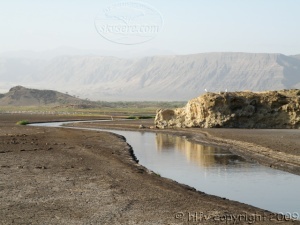 Lake Natron area is a dry and above all an hauntingly beautiful area ! Be sure to plan some days in this magnificent zone and your stay will be an outstanding experience . It is a geological feature stretching from Syria inthe north andspreading southward in EastAfrica from Ethiopia, through Kenya and Tanzania to Mozambique. It is a huge fault formed in the earth’s crust and dotted with both active and extinct volcanoes. In the process of splitting the African plate in two new separate plates, the Great Rift Valley in East Africa has been a great source of discoveries in human evolution : particularly evident at the site of Olduvai Gorge East of the Serengeti Plains and Laetoli, with the discoveries by the archeologists Leakey of some of the earliest remains of fossil hominids in 1959 and later. Maasai people have nilotic origin, and they migrated South in the fifteenth century, from the Nile Valley in Egypt and Soudan to reach in the seventeenth century Southern Kenya and Northern Tanzania where they live now. The Maasai are pastoralists and semi-nomadic people. 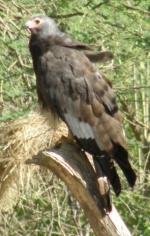 On their migratory way South, they have been regarded for their strength and their high warrior performances. They have resisted in being imposed a more sedentary way of life. Livestock such as cattle, sheep, goats are central to the livelihood of the Maasai people and represents their main wealth. The cattle is the primary source of income for the Maasai. They speak Maa language, an east nilotic language and are also educated in swahili and english. They live in circular houses –Inkajijik- (in Maasai language), made of boughs cemented with mud, cow dung, and loaf-shaped. The Maasai Boma is the village surrounded by a fence made of acacia thorns to prevent wildlife from attacking cattle. It is the women’s responsability to build houses and to keep family and home, while men are in charge of boma and family security and boys of herding livestock. The modern world has now an influence on the traditional society by new emerging forms of employment including farming, business such as running shops, restaurants, campsites, tourist guides, selling art and crafts –beadwork and jewellery, small wooden stools, knives and traditional clothing-, etc. All the same, Maasai people are determined to keep their independance and the attachment to their traditions, their culture. Located at 610 m on the Great Rift Valley Escarpment in Northern Tanzania, Lake Natron is adjacent to the extinct Gelai Volcano and near the active Oldoinyo Lengaï. It is a large soda lake (water full of sodium carbonate) that seems hostile to any living creature, except for an endemic species of fish, the alkaline tilapia, and also for the Spirulina a blue-green algae with red pigments, micro-organism the flamingoes feed on. The lake is home of more than a million of flamingoes, more particularly the pinkish white plumage Lesser Flamingoes : indeed it provides food and breeding place for these birds which are outright suited to the hard environment of a volcanic lake. 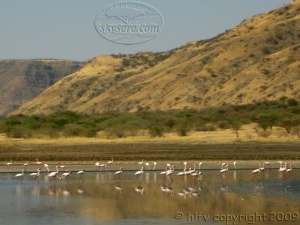 Lake Natron is the most important flamingo breeding place on earth. The flamingoes feed on the Spirulina algae abundant in the waters of Lake Natron and which pigments give the birds feathers their pink color. The alcaline waters of the lake provide a natural protection barrier against predators, even if hyenas, marabou storks, and jackals try to come near ! When the lake recedes, and the algae they eat is diminushing, it’s time for flamingoes to depart and migrate in search for a suitable new lake : it is the migration of thousands of flamingoes towards South Africa. There are other African breeding sites but principally Lesser Flamingoes breed on the highly caustic Lake Natron ! 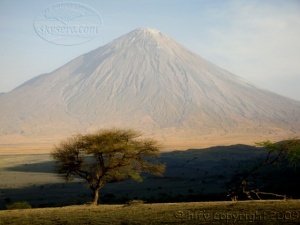 Mount Oldo-inyo-Lengai or ''mountain of God'' as the Maasai refer to it. Around 2 880m high, it is located in a section of the East African Great Rift Valley, North East of Ngorongoro and South of Lake Natron. It is the only one active volcano in Tanzania, and it is unique in the world because of the characteristic of its lava. The Oldoinyo Lengai lava is natrocarbonatite : the lava is only about 510°C and very fluid. Black when it is erupted, the lava turns white as it gets cooler. Because of the successive phases of eruptive activity, the crater formed on the top of the volcano filled up and lava was erupting from small cones called hornitos. In 1998 lava overflowed on the slopes giving to the volcano a snowy aspect due to the white color of the cooled lava. In the 2007/2008 many violent eruptions modified the morphology of the volcano and formed a new crater several hundreds meters deep and diameter too. In this area, it is the beautiful landscape which is so upsetting ! After the day heat, drive to the Lake and do an easy walk to the Hot Springs. Enjoy the beauty of the Lake, and of its resident flamingoes. Drive to the Ngare Sero Gorge then walk to the waterfalls through and along the Ngare Sero River. 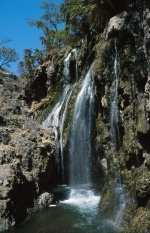 Drive to the Ngare Sero Gorge then do a longer walk to the upper waterfalls and to the source. Early in the morning or in the late afternoon enjoy an easy walk on the soda flats beside the lake watching flamingoes and looking for animals print (ostrich, jackal, hyena) on the ground. Visit of a Maasai Boma, Maasai medicine walk, Maasai dance. 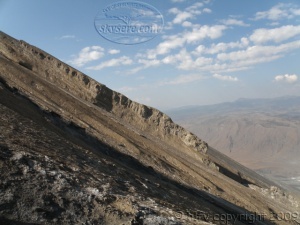 Climbing Oldoinyo Lengai is a non-tecnical but long and steep climb through a path covered with ash due to the recent eruptions in 2007/2008 ; it is not a climb to take lightly because it is an active volcano and a very tough climb, but how much rewarding ! Drive to the base of the volcano and start the climb at midnight with your Maasai guide. The ascent is not easy, it takes around 6/7 hours through the starry night to reach the top. Stay a while and enjoy the incredible awe-inspiring beauty of the place ! You will be highly rewarded by the spectacular views of the Rift Valley and Lake Natron on sun rising. Descend from the summit to the base takes 4 hours and then transfer to the campsite. 9 spacious semi-luxury tents with a private verandah and fitted with en-suite bathrooms with showers and flush toilets. 11 fly tents not self contained with private toilet and shower block. Campsite : 2 kitchens, mess tent, toilets and showers. Many activities proposed by the Camp and arranged with one of the Maasai guides. Staff and managers very nice, great relaxing atmosphere, delicious cooking, a great place to stay. We will come back soon ! Sitting on the unsheltered flats close to the lake, the tents here are shaded by a thick man-made gauze netting, which is camouflaged to blend perfectly into the landscape. 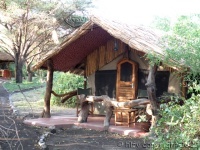 The Camp has 8 guest tents and one dining/common area tent “the Boma”. Ngare Sero Camp is a rustic option, but the food and service are good and the camp has a great atmosphere. Many activities proposed by the Camp and arranged with one of the Maasai guides.